^ Rines, George Edwin, ed. (1920). 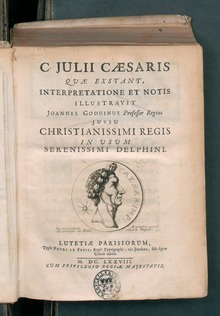 "Cæsar's Commentaries" . Encyclopedia Americana. Roman military borders and fortifications were part of a grand strategy of territorial defense in the Roman Empire, although this is a matter of debate. In particular, Goldsworthy argues that the warfare of the Parthians and Persians presented a major challenge to the expansion of Romes infantry-based armies. Individual fortifications had been constructed by the Roman military from as early as the building of Romes first city walls in the 6th or 7th century BC, systematic construction of fortifications around the periphery of the empire on a strategic scale began around 40 AD under Emperor Caligula. However, it was under Hadrians rule, which began in 117 and he spent half of his 21-year reign touring the empire and advocating for the construction of forts and walls all across the edges of the empire. The coherent construction of fortifications on a strategic scale are known as the limes. The limes consisted of fortresses for legions or vexillations as well as a system of roads for the transit of troops and, in some places. 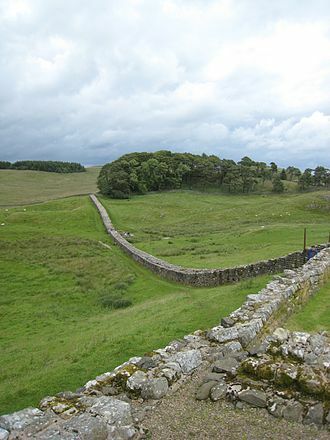 Perhaps the most famous example of these is Hadrians Wall in Great Britain, however, it is not correct to interpret other limes in the same way or to view the limes as an impenetrable barrier. Other limes would not have had a continuous man-made fortification for the entirety of their length, in places, a river, desert or natural outcropping of rock could provide the same effect for zero outlay. Additionally, an army would have been able to force a crossing of the limes using siege equipment. The limes are therefore perhaps better seen as an instrument allowing a greater economy of force in defense of a border than otherwise would be necessary to provide the level of defense. After 270, the maintenance of an impenetrable solid frontier was abandoned by Constantine I in favor of a policy, whether deliberate or forced by circumstance and this called for the maintenance of a softer, deeper perimeter area of defense, with concentrated hard points throughout its depth. In the very late Empire the frontiers became even more elastic, armies were concentrated near the heart of the empire, and enemies allowed to penetrate in cases as far inwards as the Italian peninsula before being met in battle. The rise of Hellenism and the Roman Republic are generally seen as signalling the end of the Iron Age in the Mediterranean. Roman iron-working was enhanced by a known as carburization. The Romans made use of the properties in their armaments. The Roman armies of the empire were much better equipped than early republican armies. Metals used for arms and armour primarily included iron, for construction, the army used wood and stone. The use of concrete in architecture was widely mirrored in Roman military technology, the Etruscans had invented the stone arch, and used it in bridges as well as buildings. Some Roman technologies were directly from Greek civilization. This included the advances that the Greeks had made, as well as all the scientific, political. However, the Romans made many significant technological advances, such as the invention of hydraulic cement and their methods were recorded by such luminaries as Vitruvius and Frontinus for example, who wrote handbooks to advise fellow engineers and architects. Romans knew enough history to be aware that widespread technological change had occurred in the past and brought benefits and that tradition continued as the empire grew in size and absorbed new ideas. Romans thought of themselves as practical, so small-scale innovation was common, this view is being challenged by new research that shows they did indeed innovate, and on a wide scale. Thus the watermill had been known to the Greeks, but it was the Romans who developed their efficient utilisation. The set of mills at Barbegal in southern France were worked by a single aqueduct and they probably were built by the army and supplied flour to a wide region. Floating mills were used to exploit fast flowing rivers. The Romans used water power in a way during mining operations. 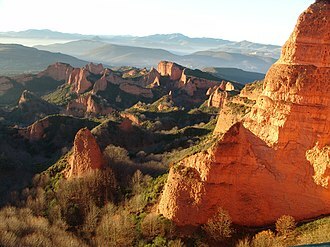 The spectacular gold mine at Las Medulas was worked by no fewer than seven long aqueducts cut into the surrounding mountains, the outflow was channelled into sluice boxes, and the heavier gold collected on rough pavements. They developed many deep mines, such as those for copper at Rio Tinto, dewatering machines, such as Archimedean screws and reverse overshot water wheels, were found in situ, one of which is on show at the British Museum. The Limes Tripolitanus was a frontier zone of defence of the Roman Empire, built in the south of what is now Tunisia and the northwest of Libya. It was primarily intended as a protection for the cities of Leptis Magna, Sabratha. The Limes Tripolitanus was built after Augustus and it was related mainly to the Garamantes menace. 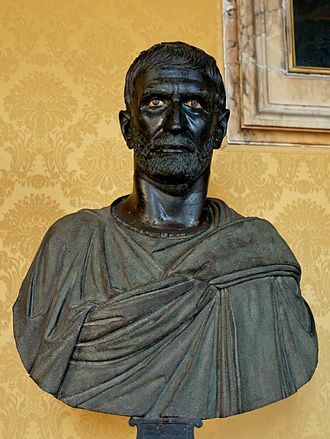 Septimius Flaccus in 50 AD did an expedition that reached the actual Fezzan. The Romans did not conquer the Garamantes so much as they seduced them with the benefits of trade, the last Garamantes foray to the coast was in AD69, when they joined with the people of Oea in battle against Leptis Magna. 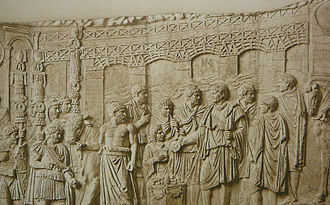 The Romans, in order to defend the main Roman cities of Tripolitania, after that the Garamantes started to become a client state of the Roman Empire, but nomads always endangered the fertile area of coastal Tripolitania. Because of this Romans created the Limes Tripolitanus The first fort on the limes was built at Thiges, the limes was expanded under emperors Hadrian and Septimius Severus, in particular under the legatus Quintus Anicius Faustus in 197-201 AD. He fulfilled his task quickly and successfully, former soldiers were settled in this area, and the arid land was developed. Dams and cisterns were built in the Wadi Ghirza to regulate the flash floods, the farmers produced cereals, vines, pulses, almonds and perhaps melons. Ghirza consisted of some forty buildings, including six fortified farms, two of them were really large. It was abandoned in the Middle Ages, with Diocletian the limes was partially abandoned and the defence of the area was done even by the Limitanei, local soldier-farmers. The Limes survived as an effective protection until Byzantine times, in Libya today, very substantial remains survive, e. g. the limes castles at Abu Nujaym and Al Qaryah al Gharbīyah, the frontier village Gaerisa, and about 2,000 fortified farms like Qaryat. Ghadames Mizda Bani Waled Abu Nujaym Qaryat Jona Lendering, archived from the original on April 5,2008. Detailed map showing the Limes Tripolitanus at Tunisia-Libya border, la Tripolitania in Storia Einaudi dei Greci e dei Romani. 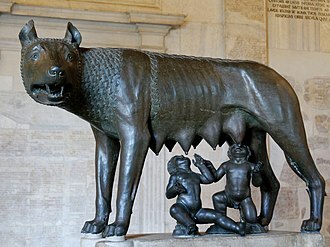 The most familiar of these myths, and perhaps the most famous of all Roman myths, is the story of Romulus and Remus, the twins who were suckled by a she-wolf. The national epic of mythical Rome, the Aeneid of Virgil, the Aeneid was written under Augustus, who claimed ancestry through Julius Caesar from the hero and his mother Venus. 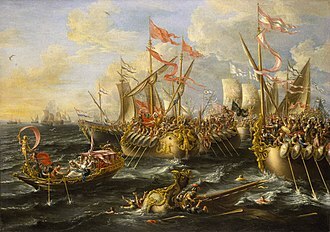 This started a series of armed conflicts with Turnus over the marriage of Lavinia, before the arrival of Aeneas, Turnus was betrothed to Lavinia, who married Aeneas, starting the war. Aeneas won the war and killed Turnus, the Trojans won the right to stay and to assimilate with the local peoples. Toward the end of line, King Procas was the father of Numitor. At Procas death, Numitor became king of Alba Longa, but Amulius captured him and sent him to prison, for many years, Amulius was the king. 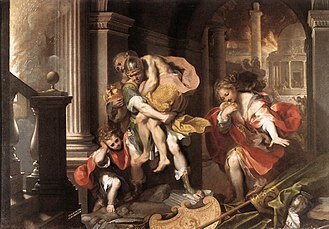 The tortuous nature of the chronology is indicated by Rhea Silvias ordination among the Vestals, the myth of Aeneas was of Greek origin and had to be reconciled with the Italian myth of Romulus and Remus, who would have been born around 771 BC if taken as historical figures. 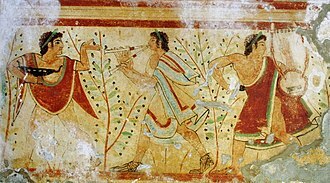 They were purported to be sons of Rhea Silvia and either Mars and they were abandoned at birth, in the manner of many mythological heroes, because of a prophecy that they would overthrow their great-uncle Amulius, who had overthrown Silvias father Numitor. They were abandoned on the Tiber River by servants who took pity on the infants, the twins were nurtured by a she-wolf until a shepherd named Faustulus found the boys and took them as his sons. 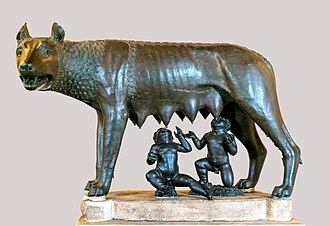 Faustulus and his wife Acca Larentia raised the children, when Remus and Romulus became adults, they killed Amulius and restored Numitor. They decided to establish a city, they quarreled, Rome began with a fratricide, a story that was taken to represent the citys history of internecine political strife and bloodshed. The ancient Romans were certain of the day Rome was founded, April 21, even the official Fasti Capitolini offers its own date,752 BC. Recent discoveries by Andrea Carandini on Romes Palatine Hill have yielded evidence of a series of walls on the north slope that can be dated to the middle of the 8th century BC. The Upper Germanic-Rhaetian Limes, or ORL, is a 550-kilometre-long section of the former external frontier of the Roman Empire between the rivers Rhine and Danube. It runs from Rheinbrohl to Eining on the Danube, the Upper Germanic-Rhaetian Limes is an archaeological site and, since 2005, a UNESCO World Heritage Site. Together with the Lower Germanic Limes it forms part of the Limes Germanicus, the term limes originally meant border path or swathe in Latin. In Germany, Limes usually refers to the Rhaetian Limes and Upper Germanic Limes, both sections of limes are named after the adjacent Roman provinces of Raetia and Germania Superior. In the Roman limites we have, for the first time in history, clearly defined borders of a sovereign state that were visible on the ground to friend. Most of the Upper German-Rhaetian Limes did not follow rivers or mountain ranges and it includes the longest land border in the European section of the limes, interrupted for only a few kilometres, by a section that follows the River Main between Großkrotzenburg and Miltenberg. By contrast, elsewhere in Europe, the limes is largely defined by the rivers Rhine, the function of the Roman military frontiers has been increasingly discussed for some time. The latest research tends to view at least the Upper Germanic-Rhaetian Limes not as a military demarcation line. The limes, it is argued, was not really suitable for fending off systematic external attacks, thanks to a skillful economic policy, the Roman Empire extended its influence far to the northeast, beyond the frontier. Evidence of this are the border crossings which, although guarded by Roman soldiers, would have enabled a brisk trade. Attempts were occasionally made, to settle Roman legions beyond the limes or, more often. 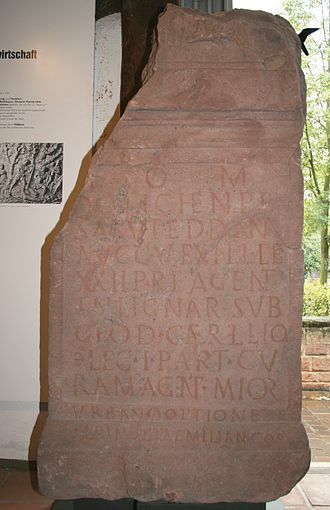 As a result, the Romanization of the population extended beyond the limes, interest in the limes as the remains of a site dating to the Roman period was rekindled in Germany at the time of the Renaissance and Renaissance humanism. 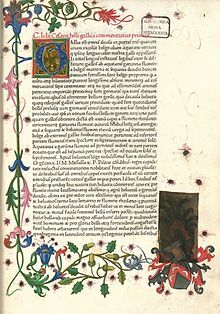 This was bolstered by the rediscovery of the Germania and Annales of Tacitus in monastic libraries in the 15th, scholars like Simon Studion researched inscriptions and discovered forts. In each war it acquired more territory until, when civil war ended the Roman Republic, nothing was left for the first emperor, Augustus, to do except declare it an empire and defend it. The role and structure of the military was altered during the empire and it became less Roman, the duties of border protection and territorial administration being more and more taken by foreign mercenaries officered by Romans. When they divided at last into warring factions the empire fell, during the Roman Republic the function of the military was defined as service to the ‘’Senatus Populusque Romanus’’, an agency designated by SPQR on public inscriptions. Its main body was the senate, which met in a still extant in the forum of Rome. Its decrees were handed off to the two officers of the state, the consuls. They could levy from the citizens military force they judged was necessary to execute the decree. This they did in a draft of male citizens assembled by age class, the officers of the legion were tasked with selecting men for the ranks. 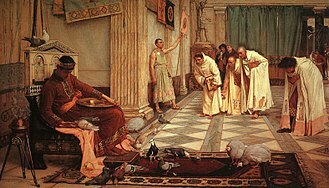 The will of the SPQR was binding on the consuls and the men, the men were under a rigorous code, known now for its punitive crucifixion. The soldiers were busy doing whatever service needed to be done, manning vessels, blacksmithing, clerking. They were trained as required, but previous skills, such as a trade, were exploited and they brought to the task and were protected by the authority of the state. The militarys campaign history stretched over 1300 years and saw Roman armies campaigning as far east as Parthia, as far south as Africa and Aegyptus and as far north as Britannia. 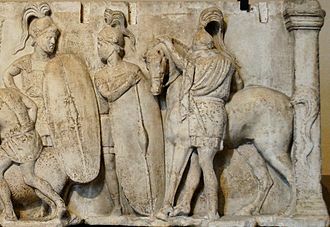 The makeup of the Roman military changed substantially over its history, from its history as an unsalaried citizen militia to a professional force. The equipment used by the military altered greatly in type over time, though there were very few improvements in weapons manufacture. For much of its history, the vast majority of Romes forces were maintained at or beyond the limits of its territory, in order to either expand Romes domain, or protect its existing borders. The military engineering of Ancient Romes armed forces was of a scale and frequency far beyond that of any of its contemporaries. 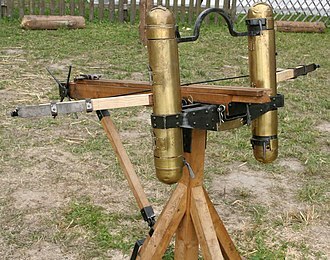 Roman military engineering took both routine and extraordinary forms, the former a proactive part of standard procedure. Each Roman legion had a military legionary fort as its permanent base, when on the march, particularly in enemy territory, the legion would, after a days marching, construct a fortified camp or castra, requiring as raw materials only earth and timber. These engineers would requisition manual labor from the soldiers at large as required, a legion could throw up a camp under enemy attack in as little as a few hours. The engineers built bridges from both timber and stone depending on required permanence, time available etc, some Roman stone bridges survive to this day. Stone bridges were made possible by the use of the keystone to allow an arch construction. One of the most notable examples of military bridge-building in the Roman Empire was Julius Caesars Bridge over the Rhine River and this bridge was completed in only ten days and is conservatively estimated to have been more than 100 m long. Caesar was able to cross over the bridge and explore the area uncontested, before crossing back over. 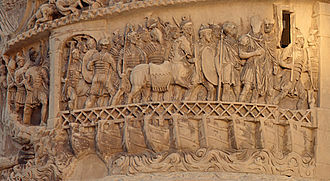 The bridge was intended to show otherwise, the 1st century BC army engineer Vitruvius describes in detail many of the Roman siege machines in his manuscript De Architectura. When invading enemy territories, the Roman army would often construct roads as they went, to allow swift reinforcement and resupply, Roman road-making skills are such that some Roman roads survive to this day. Michael Grant credits the Roman building of the Via Appia with winning them the Second Samnite War, the Roman army took part in building projects for civilian use. Of both military and civilian use was the construction of roads within the boundaries of the Empire, in which the army was heavily involved. But so too were soldiers put to use in the construction of walls, the digging of shipping canals. In some rare cases soldiers were used in mining work. It is likely that they were capable of building and operating mine equipment such as water mills, stamp mills.